Join us for our Open House Weekend on June 22-23rd. Click here for a schedule of upcoming classes, workshops and events. Our updated barn, breakout rooms, outdoor spaces and overnight accommodations make this the perfect venue to host your small group event. Click here to connect with us to discuss possibilities. Coming in the winter of 2020! Our 4 month college gap year program for college students is perfect for students who are snow sports enthusiasts looking to gain clarity and direction in academic and vocational pursuits. In addition to improving their on snow skiing and riding skills and becoming PSIA/AASI certified instructors, participants will train with success coaches and trainers to learn skills and strategies to create a blueprint for personal, professional and entrepreneurial success. Sign up here to get details as soon as they are released. 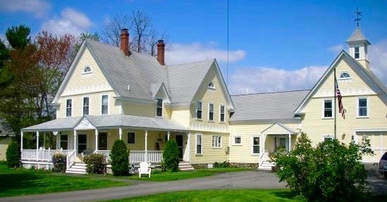 Our lovely Victorian property, pristine waterfront setting, and beautiful Mount Washington Valley location make Ripple on Silver Lake the perfect venue for a small wedding or family gathering. ​Connect with us here to discuss the details of your event. ​"Ripple on Silver Lake in New Hampshire is a beautiful place, replete with vintage charm and character. The house is spacious, clean and well kept. It is obvious Trish, the owner, cares very much about providing a comfortable and welcoming place for her guests. My room was exceptionally clean and I felt transformed in time. I took advantage of extra time during my stay to walk through the town which is just as charming as Ripple and continues the feel of a quaint and bygone time. I highly recommend Ripple on Silver Lake and hope to visit again in the future. ~Cynthia M.